If you know me, you know I’ve pretty much always been a whiskey girl. In a Wild Turkey rickhouse. I particularly enjoy bourbon so I signed up for the Maker’s Mark Ambassador program shortly after reaching drinking age. (In the US you must be 21+, enjoy responsibly) The Ambassador program is free to join and is basically the Maker’s Mark fan club/email newsletter - and a smart way to get their existing fans more hyped up and encourage them to spread the love. Through the years they have sent email newsletters with sneak peeks of updates regarding the distillery or the company (finished construction of The Cellar for year-round barrel finishing; or announcing the controversial decision to lower the proof of their product - which was met with backlash and the decision reversed before it came to be), invites to official Ambassador events in the area (annual Ambassador celebration in April; free food, swag, bottle engraving, and tastings in honor of the Ryder Cup), invites to events at or near their distillery (exclusive offers for Breeders’ Cup tickets, the Dale Chihuly exhibit at the distillery last year). Email invite for an Ambassador event. But one of the highlights of the Ambassador program is getting your name on a barrel in the distillery and tracking that barrel through the aging process. Once the bourbon in the barrel has reached the Maker’s Mark standard of taste, you are invited to visit the distillery, take a tour, and hand-dip bottle(s) containing bourbon from the barrel with your name on it. Bonus: The bottles you dip and buy also have your name on them! They did give ample time to plan the trip - I was notified in late January and given a timeframe of April - September to visit. got the notification that my @MakersMark bourbon barrel will be ready to bottle and drink in the next few months! I AM SO EXCITED, I HAVE WAITED A QUARTER OF MY LIFE FOR THIS! 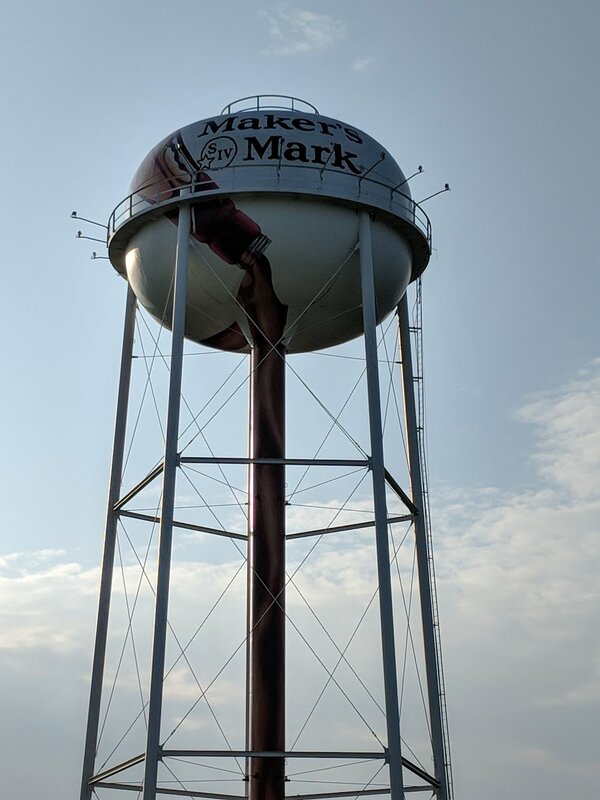 At first, I planned to visit the Maker’s Mark distillery and spend about two days near Loretto, but while trying to find accommodations and other attractions nearby, I stumbled upon the Kentucky Bourbon Trail- a tourism initiative from the Kentucky Distillers’ Association. The concept is pretty simple - get the passport stamped after a tour of each of the distilleries on the list and get a commemorative gift for the effort. Yes and no. We made it to the original ten distilleries on a legacy version of the Passport (picked up in person at one of the distilleries, not printed from online) but hit a timing snag at one location; though were still able to complete the passport and pick up the finisher tasting glass. The last stamp on the tour. Flying Southwest Airlines is still my favorite way to travel by plane - when I was in college it was the cheapest way to get between school in Chicago and my family in Las Vegas. They have pretty solid pricing out of Minneapolis/St. Paul, but are located in the smaller terminal (T2/Humphrey). Also, they don’t charge for the first two checked bags and that is crucial when traveling with a lot of toiletries or especially with bourbon. (Note: There is a limit to how much alcohol can be transported in a checked suitcase without being seized - be aware of these restrictions when shopping along the trail. We opted to fly into Louisville and rent a car from the airport. Lexington is the other major airport along the Trail, but it was more expensive for the dates and times desired. We rented a car through Alamo but booked with our airfare via Southwest. They had the best pricing, especially for the “young driver” fee. I hate driving so my partner, who is under 25, would be driving and we needed to factor in the extra cost. We reserved a compact car, but when we got to the rental car desk, the options were limited and we ended up with a pick-up truck - which worked just fine. It felt safer than a smaller car on some of the winding roads next to semi-trucks. 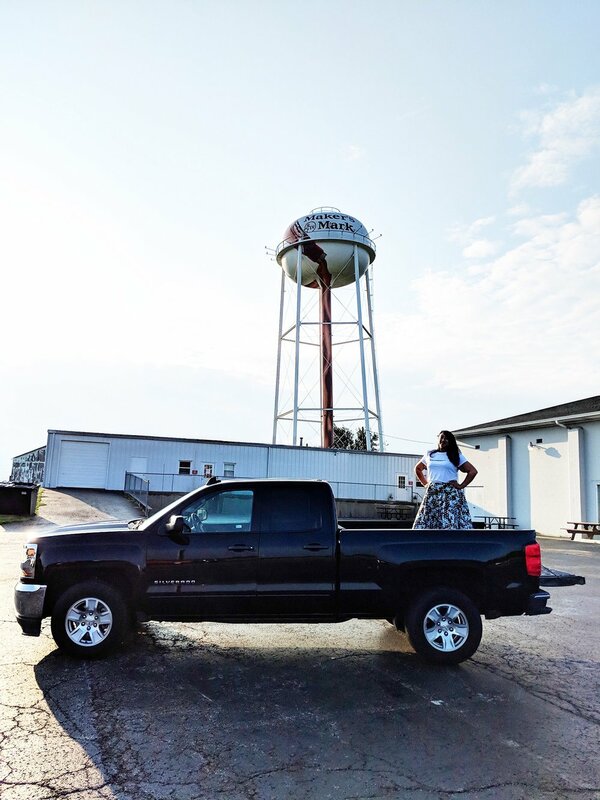 Posing with the truck, wearing the Fashionopolis 2017 Statement Piece Tee with an Alice Riot skirt in front of the Lebanon, KY x Maker's Mark water tower! Since the original plan was centered around Maker’s Mark, I wanted to stay nearest to Loretto. I considered searching for an Airbnb but without being familiar with the area or having a real plan or at the time of booking, nixed the idea and focused on hotels. The Hampton Inn Lebanon had the best rates vs reviews compared to others in the area. There were some gorgeous inns and bed-and-breakfasts nearby but none I had the budget for, sadly. I brought a bunch of snacks (pretzels, chips, trail mix, etc), a small cooler, and a couple reusable water bottles in my checked bag. Road trip snacks took up room in my bag on the way in but were mostly depleted and left room for purchases on the way out. This also cut down on any impulse convenience store buys. Also, staying hydrated between bourbon tastings was important so a cooler full of cold water was key. It was helpful also for keeping bourbon chocolates from melting in the summer sun. And on the way back, the cooler was great for packing away the commemorative tasting glasses and even one bottle of bourbon, with less fear they would somehow get broken in transit. Overall, the Kentucky Bourbon Trail is a great experience for first-time visitors to Kentucky who are casual bourbon fans. The surge in popularity of bourbon and bourbon tourism has created some changes for the KDA, the Kentucky Bourbon Trail, and the Kentucky Bourbon Trail Craft Tour, so be aware of changes and allow more time than I did to be able to complete the latest version(s). There are many distilleries in Kentucky that are not part of the trail initiatives that are certainly worth visiting or learning more about, as well as a number of museums or historical sites. The Corvette Museum, Mary Todd Lincoln House, and Muhammad Ali Center are some of the major museums near the Bourbon Trail distilleries. Tasting offerings at the Bulleit/Stitzel-Weller distillery experience. When I travel with myself or a partner, rather than going somewhere new (like when I travel with my family), I tend to visit my favorite cities and partake in a mix of favorite things and new things. After completing the KBT, I feel that I will happily add Kentucky to my rotation of favorite places to visit, aiming to go back to some of my favorite places from this trip and make it out to some of the places I couldn’t get to or didn’t know about yet. 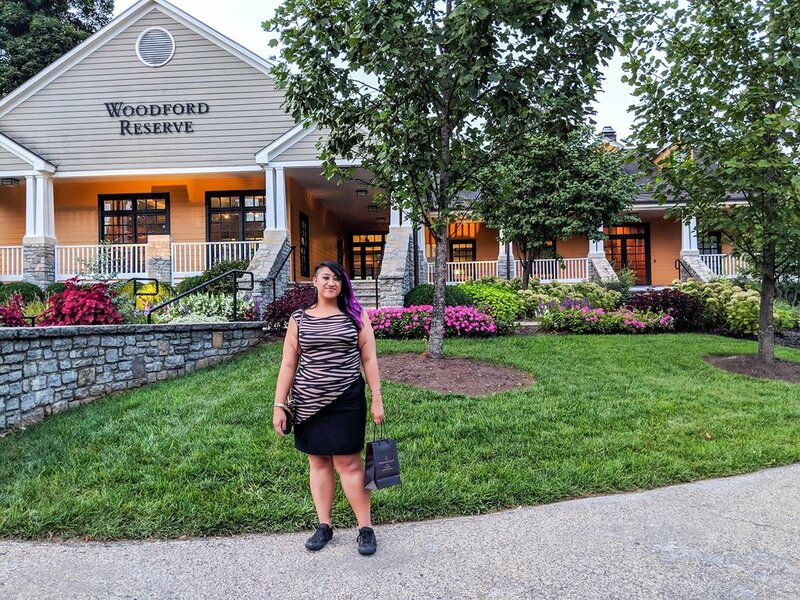 The Woodford Reserve distillery had me all 😍. Wearing a Tessa Louise top and thrifted skirt.